Vuototecnica is a company standing out for unique know-how, gained in over 40 years of activity side by side with customers. The Italian company Vuototecnica has operated for over 40 years in the technologies for the vacuum management and use. Several are the sectors to which it dedicates its competence: automotive, graphics and printing, logistics, packaging, glass industry, automation, food industry, renewable energies, woodworking industry, shipbuilding yards, building sector and all those fields where the vacuum creation or the gripping with vacuum suction cups can represent an efficacious solution. Supported by the tradition and the passion for its activity, transmitted from father to son, Vuototecnica has made improvement and innovation its mission, in black and white written in Vacuum Solutions catalogue, which contains over 800 pages of products and solutions. In the meantime, research goes on every day: vacuum suction cup loaders and unloaders, degassing systems, vacuum handlers and travelling lifts, vacuum pumps and accessories needed by each vacuum-operating plant. A complete all-round range allows customers to choose, in the variety of vacuum components (all strictly made in Italy), the product best meeting their requirements, which can be satisfied by the Lombard company also through customized solutions. 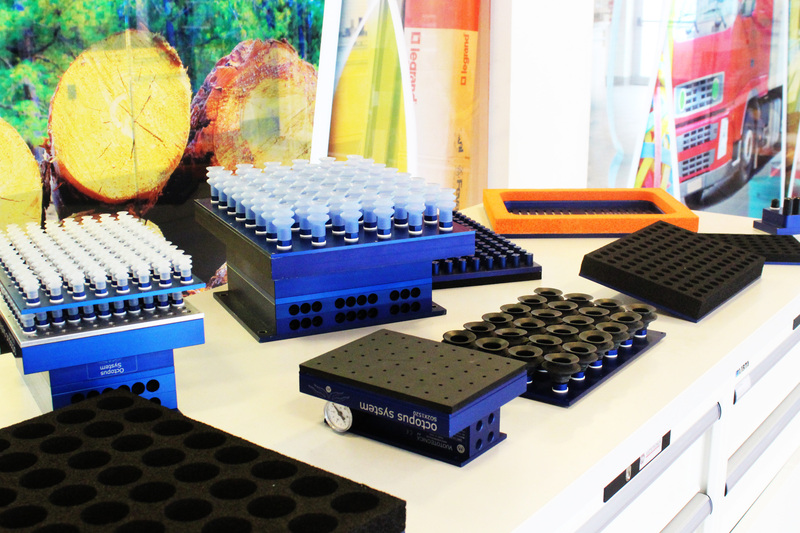 Vuototecnica bets on technological research and on the specific design of each product according to customers’ needs. Optimizing and simplifying manufacturing processes in different application sectors is the target of the future. On the Italian market, the goal has always been reaching end-users in simple and useful manner. In this course, the company’s partners-distributors have been and still are very important; long-term relationships have been established with them, in the name of reliability, experience, cooperation and innovation. In the new headquarters at Beverate Brivio, built in 2010, training, constant research and meetings with distributors have always held great relevance. Besides manufacturing, it houses in fact didactic rooms and dialogue spaces purposely conceived to favour the knowledge transfer and a direct relationship between the production and the application of components on the field. An area exceeding 4000 square metres hosts offices, research laboratories and the permanent showroom. Built according to the most advanced criteria of eco-compatibility and energy saving, it fully mirrors the farsightedness and clarity philosophy the company has undertaken and it represents a serene and fruitful work environment for the development of ideas. Knowledge and sharing remain the bearing pillar of the success of the company- distributor- final customer chain. Concerning this, in the last years they have decided to stake also on web communication with the blog, in Italian and English version, the applications for iPhone and iPad, catalogues and brochures in pdf, the internet site and social networks, among which the highly surfed Youtube channel with the most popular applications. Among the new developed solutions, it is worth highlighting Octopus vacuum gripping system, with customized heads manufactured with 3D printer, particularly suitable for the producers of anthropomorphic robots and palletizing plants as it can grip objects of any shape and nature, even when their surface takes up just 5% of the suction plate. 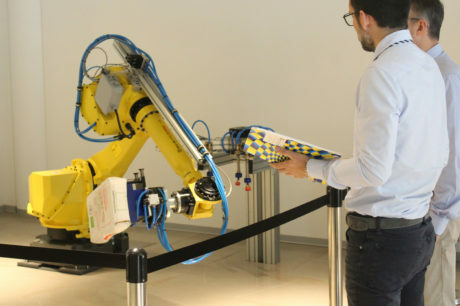 Octopus allows in fact handling bags with loose products, small items, objects with inhomogeneous surfaces and several other parts, without needing the change of the format of the whole gripping device, as it is sufficient to dismount the suction plate and to replace it with another. The operation principle of Octopus gripping bars is based on the vacuum differential generated inside their base box, when the generator flow rate exceeds the quantity of air sucked through the holes of the suction plate. Octopus gripping bars are composed by: an aluminium or polizene® grooved fixing plate, for a fast installation on the automatism and an easy positioning with regard to the load to be gripped; two or three vacuum generators, according to their size, powered by compressed air; an aluminium or polizene® base box; a micro-drilled aluminium suction plate, coated by foam rubber or bellows vacuum suction cups (also with self-closing valves).Suction plates are interchangeable on all gripping bars; it is in fact possible to replace a micro-drilled suction plate coated by foam rubber with a plate with vacuum suction cups or self-closing valves, depending on demanded applications. Gripping bars can also operate on horizontal, vertical, sloping and upside down surfaces. The foam rubber is self-adhesive, easily replaceable, and it is made of a special compound that allows gripping on irregular and rough surfaces and maintains elasticity even after countless cycles. 3D printers for gripping heads. As alternative, bellows vacuum suction cups compensate accentuated planarity errors and can work on inclined surfaces, too. They are suggested, for instance, to grip deformable cardboard boxes and bundles of products wrapped with shrink film. Bellows vacuum suction cups can be supplied, as standard, of anti-oil rubber, natural para rubber, silicone and, on demand, of special compounds. Everything is easily dismounted and inspected, also by non-specialized staff. The micro-holes of suction plates are self-cleaning; dusts and filth that cross them cannot deposit and the suction section remains unchanged. A filtering disc made of stainless steel mesh retains dusts. Impalpable dusts, instead, those that the filtering disc does not retain, are sucked and ejected by the vacuum generator. Base boxes of Octopus bars are equipped with supplementary connections for control instruments and the counter-blow with compressed air, for a faster unloading of the lifted load. Finally, among Vuototecnica novelties concerning Octopus, it is worth mentioning the new gripping heads, implemented with 3D printer, for single pieces. The 3D printing of heads has enhanced the possibilities of Octopus, with a product customization that was previously unconceivable. The benefits of the adoption of the additive manufacturing can be found in the lightness and high mechanical resistance, for heads that can be produced even in single-unit batches, upon design purposely drawn up. In this way, customers’ handling issues can be treated individually, to suit the shape of the object to be gripped, up to wrapping it. 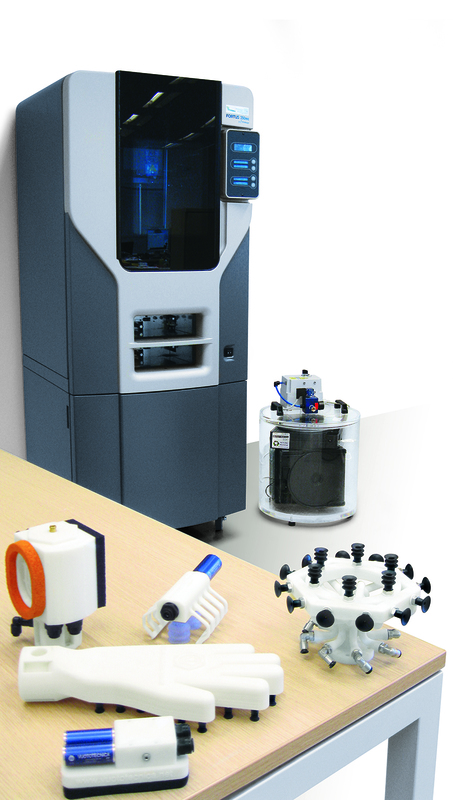 Moreover, thanks to the 3D printing, Vuototecnica response takes even shorter times. Cup-shaped vacuum gripping hands, with integrated vacuum generation, are implemented in few working days and they are ideal for delta robots or for flexible pickers, for which the lightness-speed matching is fundamental. MSVE vacuum generators by Vuototecnica represent the suitable solution for the automation of vacuum suction cup gripping systems. They are ideal for handling sheet metals, glasses, marbles, ceramics, plastic, cardboards, wood and in the industrial robotics sector, which requires systems with excellent performances and, at the same time, small sizes and light weight, in order to be installed in whatever position. The original system of compressed air supply through coaxial shutters allows the delivery of big air quantities to ejectors and ejection system, for a faster load gripping and deposition. They are equipped with single-stage ejectors, powered at low pressure (max 4 bars), they have very high emptying speeds, compared to their suction capacity. We are speaking of very high speeds, to full benefit of fast and performing cycles. The check valve, integrated on the suction connection, grants also the vacuum maintenance for use, even if the electric current is missing. Under fully safety and with relevant saving of compressed air. 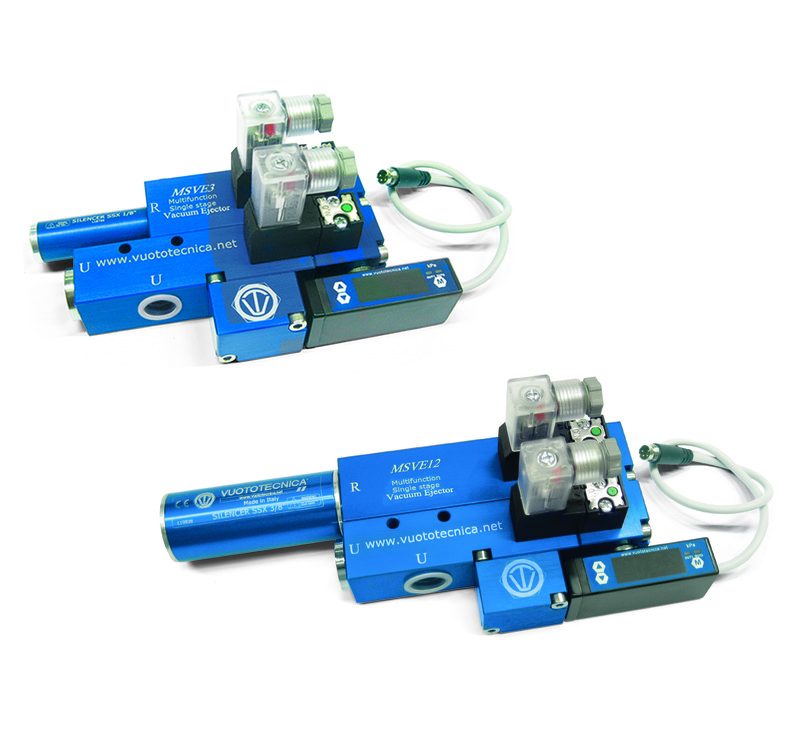 Two micro-solenoid valves manage the compressed air supply to the vacuum injector and to the unload counter-blow, the latter with adjustable intensity and duration, through a screw flow regulator. In fact, operating the micro-solenoid valve for the compressed air supply, the generator creates vacuum for use; when the set value is reached, the pneumatic pumpset intervenes on the electric coil of the micro-solenoid valve and interrupts the air delivery. It restores it only when the vacuum value decreases under the minimum value. This modulation, besides preserving the vacuum degree within the pre-established safety values (hysteresis), allows a notable saving of compressed air. A second signal of the pneumatic pumpset, it too adjustable and independent from the first, can be used to allow the cycle start when the vacuum degree reached is the suitable one for use. Once ended the work cycle, the micro-solenoid valve for the compressed air supply to the generator is deactivated and, simultaneously, the ejection micro-solenoid valve is enabled for the fast restoration of the atmospheric use pressure. A digital pneumatic vacuum pumpset with display and LEDS of switchover warning manages the compressed air supply and provides a signal for the cycle start under safety conditions. All parts can be easily inspected and maintained and materials feature guaranteed quality. Family-run company, established in July 1975 by Giuliano Bosi, soon joined by his sons Daniela and Davide, has always stood out for the constant commitment to reaching targets, soundly rooted in the past and ready to drive the present and to face the future at best. The Seventies were characterized by great innovation in industrial ambit, with a cultural dynamism in which Vuototecnica took part with enthusiasm, registering the first patents and proposing innovative solutions in the vacuum field. The first models of solenoid valves for vacuum, reduction gears and self-closing valves are still in production, thus witnessing the capability of looking at the future with wisdom. In few years, once made the first experiences, developed the first products and designed new solutions, Vuototecnica starts its mission as “engineering partner” of various companies in diametrically opposite industrial sectors: from automotive to building enterprises, from the food sector to the metal industry, from logistics to packaging, from the glass industry to the graphics sector, encompassing automation, logistics, medicine, renewable energies, woodworking industry, shipbuilding yards, machine tools and several other sectors. Since the half of the Eighties, Vuototecnica has focused its attention on foreign markets, favouring the collaboration with international enterprises. Unity and sharing of common projects and educational courses allow facing the course of the constant research on which every technological innovation is based, and for this reason it proposes didactic training courses to international and Italian distributors.